Watch your friends reactions as your hands glow in the dark or under blacklight (after charging under light). Our Pure Radiant Gloves are available in one size ONLY, which generally fits most adults and teens. These gloves are stretchy and offer a lot of flexibility of what hand size each glove will fit, but will be too large for younger children and may be too tight for those with larger hands. The length of the gloves from tip to tip (including the hand part and wrist part) is 8 1/2". We highly recommend measuring your hands before purchase to ensure proper fit, as gloves are not returnable once opened unless defective. Uses "Next Generation" Glow material that lasts much longer than conventional glow-in-the-dark products! Need a helping hand? These gloves are white (in the light) and glow green (in the dark). They will glow brightly in the dark after being charged with light and they glow very well under blacklight too. The gloves are designed for signing in the dark, however, you can get creative and find other uses for the glove. MORE ON THE GLOW MATERIAL: Bright Hands are made with the next generation of glow powder which enables the gloves to glow all night with a proper charge. (This powder is embedded in the glove during manufacture and does not come off or wear out.) There are two basic glow-in-the-dark (GID) powders. The older style that has been around for many years is Zinc Sulfide with Copper as an activator. Everyone has seen products made with Zinc Sulfide, for example - those old GID stars for kids rooms. We know what's on your mind - they didn't glow for very long back then and they don't glow for very long now. 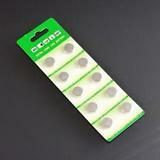 Fortunately, due to a new advance in GID technology, recently a new GID powder has been developed. The newer style is Strontium Aluminate with Europium as an activator. The powder is a non-radioactive phosphorescent pigment with extreme afterglow. The afterglow is about 10 times longer than conventional pigments and about 10 times brighter. The green glow has a wavelength of 520nm. 1) How long and brightly do the gloves glow? The amount of glow depends upon your perception of the glow. The gloves will actually glow for up to 14 hours on a full charge, but how well you see the glow depends upon a number of factors. If there is ambient light, your eyes will have a tendency to adjust for that ambient light. If your eyes are not well adjusted to the dark, you may have trouble seeing the glow. If I get up in the middle of the night and walk into a dark room with the gloves, I will see them very well. If I come from outside on a sunny day and walk into the same room, I will not see the glow until my eyes adjust to the darkness. The gloves work very well in a darkened theater or nightclub, or outdoors at night as long as there is not a lot of ambient lighting from streetlights, etc. For performance use, the gloves can be made to glow continuously and very brightly under blacklight or UV exposure. 2) How do I charge the gloves? Bright sunlight or UV light will charge the photoluminescent powder in the gloves fastest. A fluorescent light fixture will work better than an incandescent bulb, but nearly any light source will do. Of course, the closer and more focused the light source, the better it will work on the gloves. Even if you leave the gloves under normal office or home lighting during the day without targeting any light directly on the gloves, they should be partly charged by nightfall. 3) What is the best way to charge both sides of the gloves at once? If you wish to create an even glow on both sides of the gloves simultaneously, we recommend exposing both sides to equal lighting. One way to do this is to stuff a sock or some paper into the gloves so they stand up, then shine a light overhead that will hit both sides evenly. 4) How does temperature affect the glow? The warmer the better. This product does not glow very well in very low temperatures. 5) How many times can the gloves be recharged? 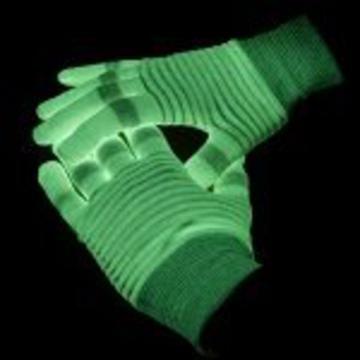 Unlike chemical glow items (like glowsticks) which can only be used one time until the chemical reaction ceases, our glow gloves use next generation photoluminescent glow powder embedded into the gloves which is rechargeable over and over without any diminishment in the glow quality. 6) Will this glow powder rub off the glove? No, the powder is embedded deep into the glove material when manufactured and will not come off under normal use or hand-washing. The glow powder is a non-radioactive phosphorescent pigment with extreme after glow. Of course, any severe use that would damage the actual fabric of the glove would also damage the glow effect in that portion. 7) How safe are these gloves for use around children, people with allergies, or pets? We are not aware of any allergic reaction that can be caused by contact with the glow gloves. The embedded non-radioactive powder does not come off under everyday use. The powder used is commercial grade and has not been approved for direct application to hair, skin, food, etc. but is safe in its application within the gloves. 8) What is the best way to care for the gloves? The gloves are made of stretchy, flexible fabric which retains its shape well and does not need any special care. As the gloves are white color in the light, everyday precautions should be taken as with any light-colored clothing to prevent transfer of dirt. Gloves should only be hand-washed with mild soap and water.